1. You may erase pixels for items to fit or flip & mirror. Please do not edit in any other way - you may not resize or change colors. 3. Tubes may not be used or sold as-is. You must add other items to make a finished piece. 4. Tubes may not be offered to other users as creatable pieces in any way including offering as tubes, lines, tutorials, brushes, etc. 5. Tubes may only be used in end-use products such as sigtags, websets, premades, stationery, etc. 6. Any offerings you make with these items must still be protected by the required image-protection scripts (meaning you may not offer them as linkware on a page with no scripts in place, you would need a request system or have them behind a free password-protected membership area). 8. Membership sites must provide a "guest" password so I can ensure the TOU are being followed. 9. You must provide an active link to my site with your tube logo on your page of credits/memberships. Such a cute set! I just love these lil leprechauns and the Irish dancers! :) I thought it would be so cute to draw them with different dancing poses, for some really great animations. If you haven't seen Irish dancing before, I highly suggest checking it out on YouTube. I can watch it for hours! Happy St. Pat's! If you have issues with the cart, please order with my standard order form (link on the left). If you loved the Lollidots, you will adore these cuties!! They are a much bigger version of my Lollidots, with just a little bit of their own charm :) This set is all about fun and spring colors, and playing dress up of course! This set is all about love, of course! This time I've drawn a boy and girl couple in different poses (including a side-view this time) with lots of hearts and flowers, teddy bears, even some adorable swans which could be used as boats to take the boy and girl through the "Tunnel of Love" :) Although perfect for Valentine's Day, most of the tubes in this set are perfect for year-round usage. These cuties are 100% hand-drawn by me, no lines used here. Even the words are hand-drawn. Some of the items have been merged onto the same layer, but you are welcome to cut them apart! These four special packages were originally offered separately as a Christmas special, but are only being offered as a set for this year's special. 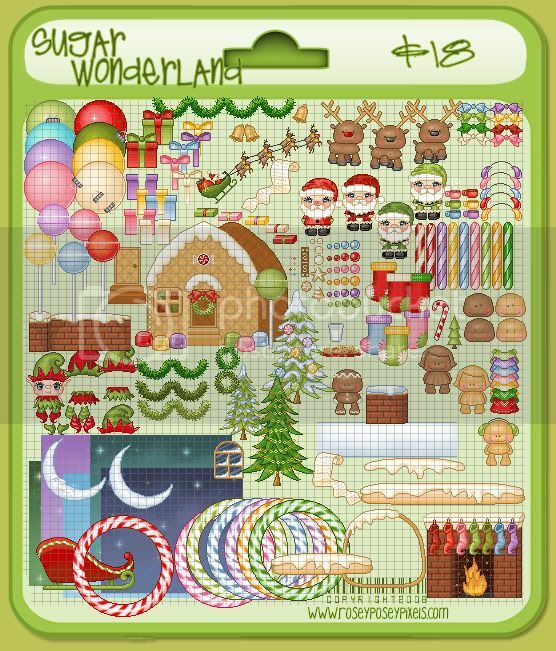 Santas, Elves, Gingerbread men and reindeer are the cute characters in this set, with lots of Christmassy props to enjoy as well - including a "decorate your own" Gingerbread house!. :) These cuties are 100% hand-drawn by me, no lines used here. Please note that with this set only, you may delete pixels on the clothes and accessories to fit all poses, however you may not make any other alterations - you may not recolor or redraw an item. Thank you for respecting my work. 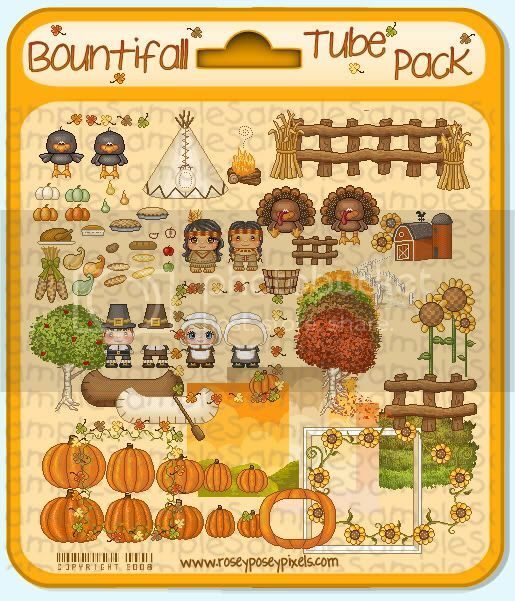 Turkeys, crows, Pilgrims, and Native Americans are the cute characters in this set, with lots of props to enjoy as well. :) These cuties are 100% hand-drawn by me, no lines used here. There is magic in the night, when pumpkins aglow with candlelight. Halloween is one of my favorite times of the year, and these tubes were so much fun! 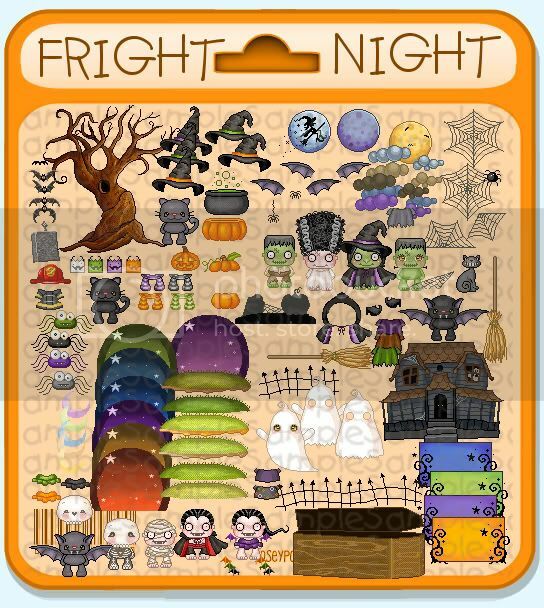 This set was created to stand alone with all the spooky characters. 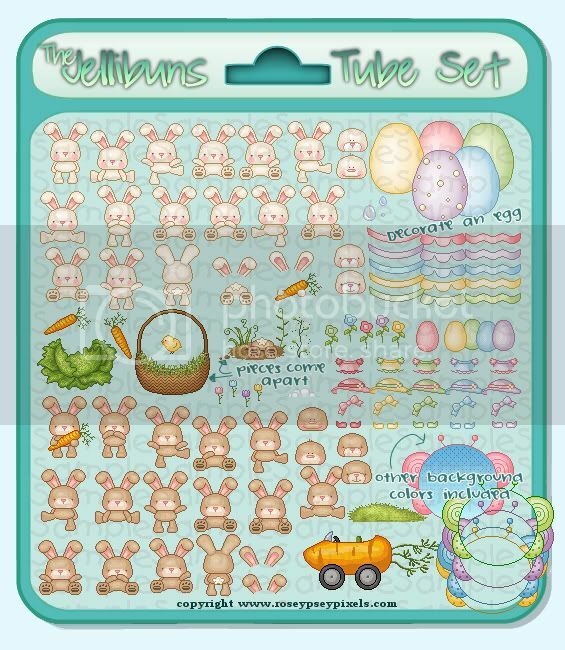 However, it's also perfect to use along with my previous tube sets on this same "base body" - the Trixies, Giggle Tots, Ruffles, Jellibuns, Lollidots, and Peppermint Pandies. 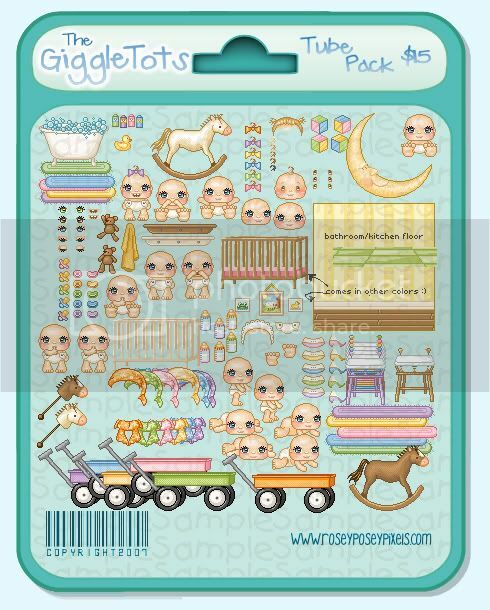 :) Please note that with this set only, you may delete pixels on the clothes and accessories to fit all poses, however you may not make any other alterations - you may not recolor or redraw an item. Thank you for respecting my work. This set comes in .psp format and has over 100 layers. If you use PSP 7, please let me know so I can split up the file for you as you will not be able to open a file with more than 100 layers. GIF format by request only (simply leave me a note in PayPal). The Trixies are here! 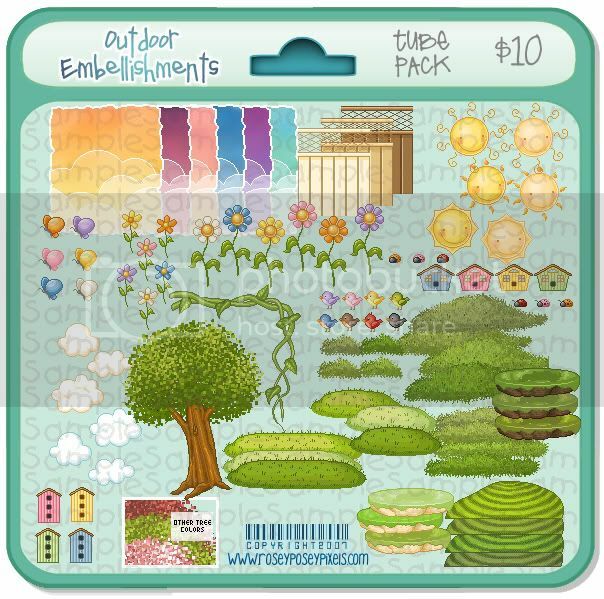 Lots of fun stuff to play with in this set, in beautiful fall colors! Most pieces come apart. These tubes are 100% hand-drawn and colored by me. I will not be offering these tubes in line art form in the future. Please note that you may switch out the faces and erase hair & clothing to fit all poses, however you may not make any other alterations -- no drawing your own body parts or using the alternative heads on other body "bases." Thank you for respecting my work. This set comes in .psp format and has well over 100 layers. If you use PSP 7, please let me know so I can split up the file for you as you will not be able to open a file with more than 100 layers. GIF format by request only. These sweet lil babies love to giggle, crawl, and play! Lots of fun stuff to play with in this set. Most pieces come apart and not all alternative colors are shown here. These tubes are 100% hand-drawn and colored by me. I will not be offering these tubes in line art form in the future. You will receive a .psp file, however a .gif version is available by request only. Please note that you may switch out the faces on the babies, however you may not make any other alterations -- no drawing your own body parts or using the alternative heads on other body "bases." Please do not take liberties with editing the tubes, there is a reason why I ask that you do not edit them. Thank you for respecting my rules. These tubes are 100% hand-drawn and colored by me. I will not be offering these tubes in line art form in the future. You will receive a .psp file, however a .gif version is available by request only. Please do not take liberties with editing the tubes, there is a reason why I ask that you do not edit them. Thank you for respecting my rules. The Ruffles are ready for warm weather! 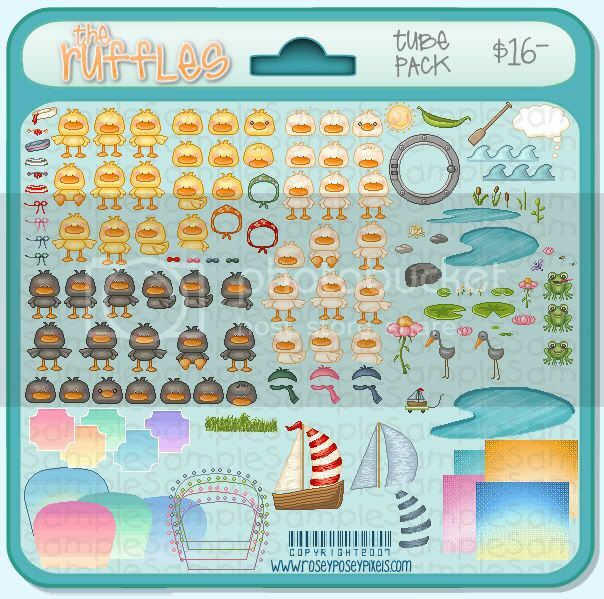 With their many sailor outfits & props, pond schtuff (complete with an adorable leaf boat), and their cute lil' froggy friends, they are sure to have a good time! These tubes are 100% hand-drawn and colored by me. I will not be offering these tubes in line art form in the future. You will receive a .psp file, however a .gif version is available by request. Please note that you may switch out the faces on the ducks, however you may not make any other alterations -- no drawing your own body parts or using the alternative heads on other body "bases." Please do not take liberties with editing the tubes, there is a reason why I ask that you do not edit them. Thank you for respecting my rules. The Jellibuns have arrived, just in time for spring!! These tubes are 100% hand-drawn and colored by me. I will not be offering these tubes in line art form in the future. You will receive a .psp file, however a .gif version is available by request. Please note that you may switch out the faces and ears on the bunnies, however you may not make any other alterations to the bunnies - no drawing your own ears or using the ears on other body "bases." Please do not take liberties with editing the tubes, there is a reason why I ask that you do not edit them. Thank you for respecting my rules. Pull on some galoshes, grab the umbrella, and let's go puddle-jumping! The squishy teddy bears love to play in the rain! The Teddycakes are 100% hand-drawn and pixel-shaded by me. I will not be offering these bears in line art form in the future. This set offers three different colors of bears, easy to customize as they are not already "clothed," and several pieces that come apart for more flexibility. For example, the clouds come off of the rainbows, the rain drops come apart. 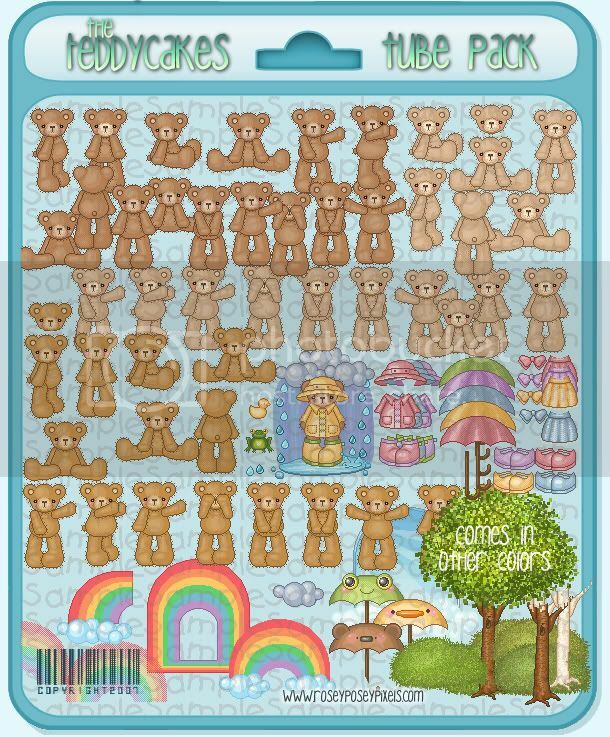 Please note that the arrangement in the middle all comes apart and not all items are shown - there are other colors for the tree leaves and two backside teddies included in order to make a wiggling tail animation. Lollidots are kin to the Peppermint Pandy bears and are just as sweet! These tubes are 100% hand-drawn and colored by me. I will not be offering these bears in line art form in the future. 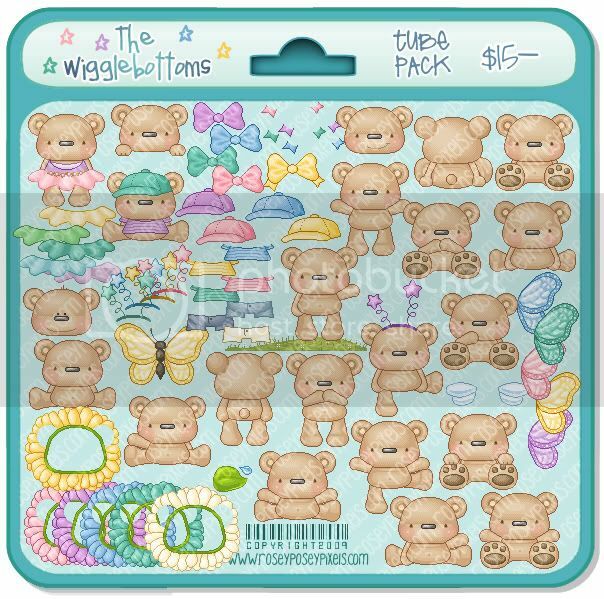 This is a very versatile set as the bears aren't already "clothed" and can take you through many seasons. You will receive a .psp file, however a .gif version is available by request. Peppermint Pandies are cute as candy! These tubes are 100% hand drawn and colored by me. I will not be offering these bears in line art form in the future. 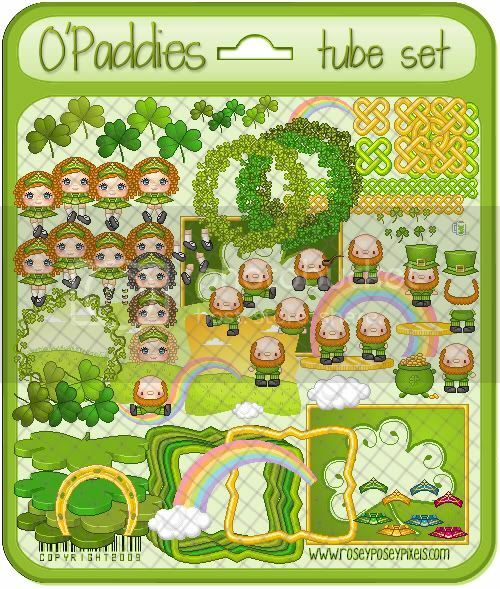 This is a very versatile set as the bears aren't already "clothed" and can take you through all seasons.